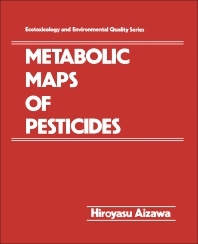 Metabolic Maps of Pesticides provides a summary of investigations and drawings of the metabolic patterns on pesticides that were collected with the aid of Chemical Abstracts Service (CAS) for the years 1970-1979. Some maps were taken from the original reports, some were slightly modified for clarity, and some were tentatively drawn from descriptions in the original articles. The pesticides are classified based on their chemical structures as functional groups or based on common chemical nomenclature. The chemical classifications highlight the properties of the mother pesticides and the impact of their degenerative metabolites on the environment. Metabolic maps are provided for the following: acid amides, amidines and guanidines, anilines and nitrobenzenes, biphenyl ethers, DDT and its analogs, dithio- and thiolcarbamates, five- and six-membered heterocyclic compounds, imides, organochlorine compounds, oxime carbamates, phenoxyacetic acids, pheny ring fused five-membered heterocyclic compounds, phenyl(aryl) carbamates, phenylureas and related compounds, phosphonothiolates and phosphonothioates, phosphonates, phosphorothioamides, phosphates, phosphorothiolates, pyrethroids, pyridines, triazines, and substituted benzenes and miscellaneous compounds. Hiroyasu Aizawa is the president of HRCI, Hiro Research Consultancy Inc., Japan, and a professor at the Applied Science Research Center, Tamagawa University Research Institute, Japan. He has considerable experience in the field of pesticide chemistry, including chemical synthesis, residue analysis, metabolism, and regulatory issues, and in the field of biologically active natural products gained from working in academia, chemical industries, and toxicology institutes and collaborating with government institutes and universities.